We met up with our three guides Simon, Natt, and Ning from Expique at a SkyTrain station in the outskirts of Bangkok. 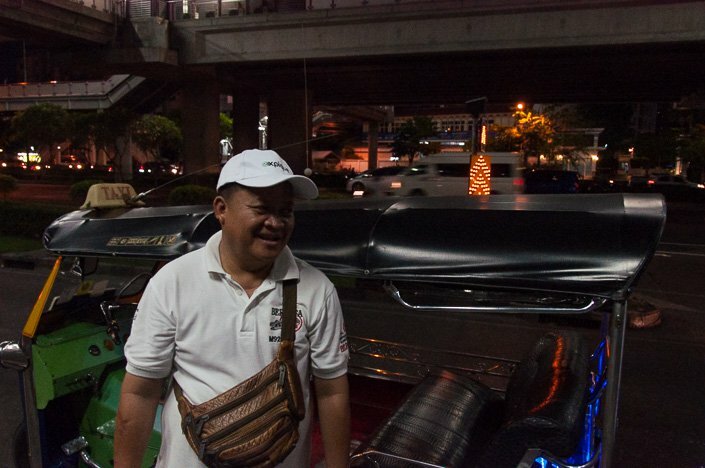 We were all put in tuk-tuks and headed off into the bustling Bangkok night. 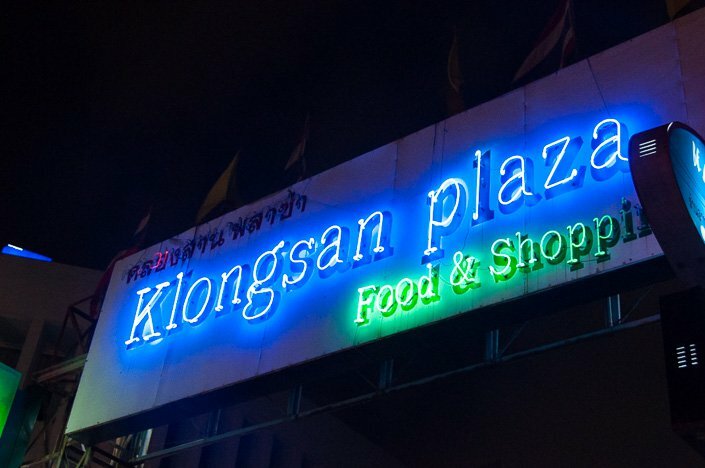 Our first stop on the tour was at the vibrant and busy Klongsan Plaza night market. This area used to be a train station back in the day. Here you will find everything from trendy clothes, shoes, jewelry, jeans, accessories…..Yep, basically everything you might need for a new look! 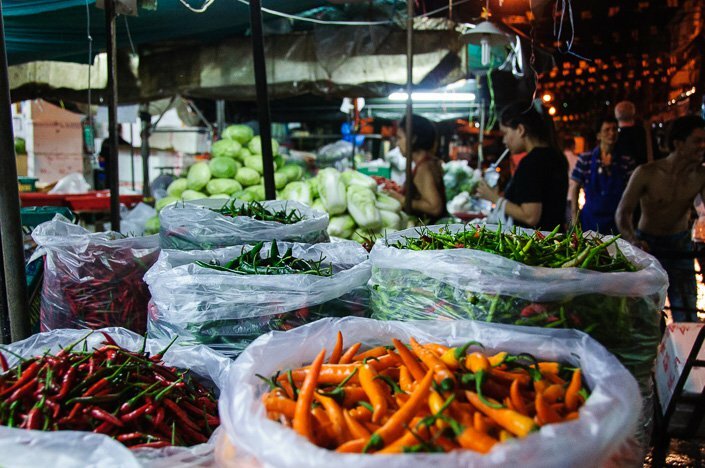 Few tourists know about this market, which is a lucky thing because that means they are likely to be charging Thai prices. You will also find many stands selling food, drinks, and snacks here. 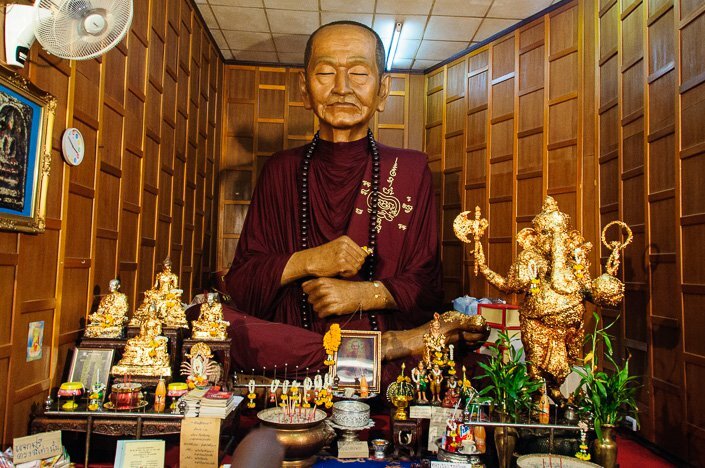 In this market, we also stopped to visit a giant Buddhist monk (not a real one, a doll). 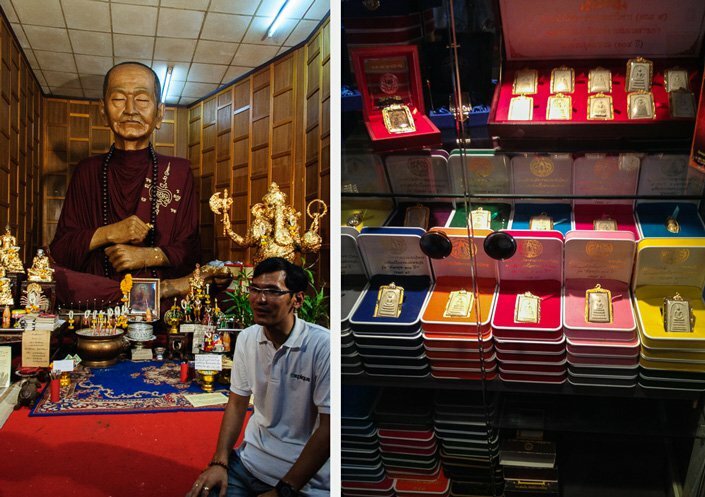 Here they also sell amulets that will protect you and give you a long and happy life. Our guide Natt telling us about the monk (to the left), and good luck Buddha amulets for sale (to the right). After a short tuk-tuk ride, we stopped at the beautiful shining white Wat Prayoon (or Wat Rua Lek). This temple is 138 years old and was built during King Rama III’s period (1824-1851). 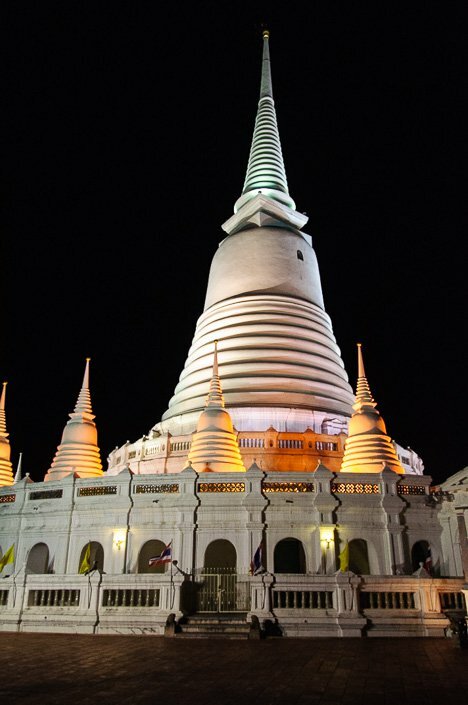 Wat Prayoon received the UNESCO Cultural Heritage Conservation Award of Excellence only two months ago, in April 2014. The temple includes a large inverted bell shaped pagoda, Turtle Mountain with its spirit house and a turtle pond where visitors can feed the turtles. We did not feed or see any turtle; they had probably all gone to sleep. Thais believe that to save the life of a turtle, gives you a long life. Wat Prayoo is impressive in size and sits on an 80-meter base. After Wat Prayoo, it was time to leave the tuk-tuks and try another transportation favorite among the locals. So we jumped on a river shuttle ferry. Along the way, Expique provided us with typical Thai snacks. At the Klongsan Market, they gave us deep fried fish cakes, and here as we waited for the ferry we were given green Thai custard flavoured dip with bread for dipping. It was delicious! We have never dared to try any of these snacks before, as they look a bit strange :). 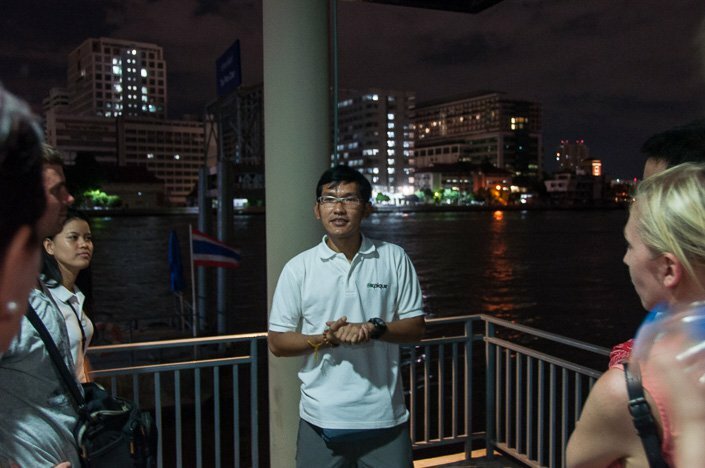 Our excellent guide Natt is telling us about the importance of the rivers in Bangkok. 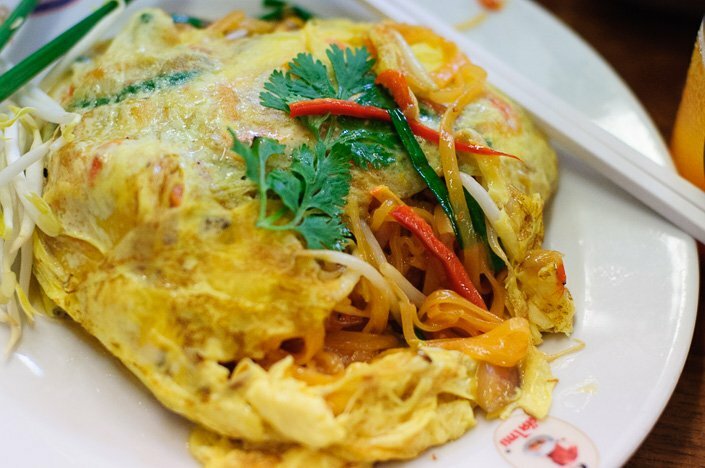 We visited the restaurant Thip Samai, which apparently has the best Pad Thai in Bangkok! Not bad considering that they sell Pad Thai EVERYWHERE in this city :). So we had high expectations about this Pad Thai, and it did not disappoint! 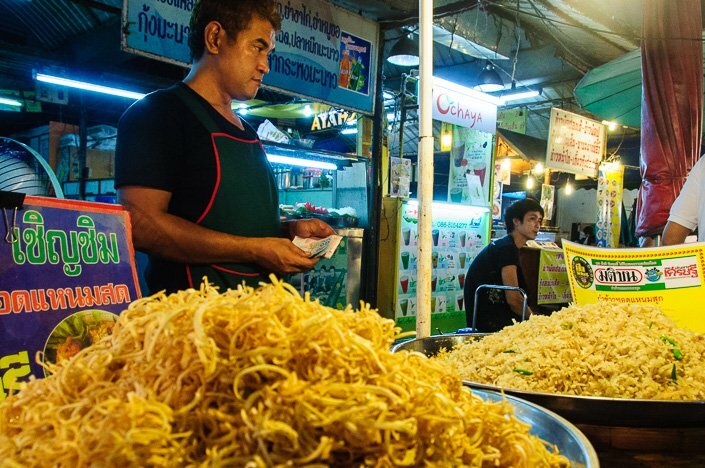 So is it the best in Bangkok? Impossible to say, but we have eaten a lot of Pad Thais over the years, and this one was delicious! Thip Samai also have the most amazing orange juice I have ever tasted! It was so fresh and full of flavor! I could just feel it`s healthfulness as I was drinking it, filling me up with vitamin C. So if you go here, make sure to order the orange juice and not just another Singha (which you can buy everywhere in Thailand). After getting our energy back, we headed over to Bangkok`s Giant Swing (Sao Ching Cha). Yep, you read correct….a HUGE swing! It is located next to Wat Suthat, one of the most important Buddhist centers in Thailand, which also has a lot of bronze sculptures. You can`t miss it, as it is tremendously tall! The city’s iconic Giant Swing is over 21 meters high and painted blood red. It was built in 1784 by King Rama I, two years after the establishment of Bangkok as the new capital, and shows the strong influence of Brahmanism in Thailand. 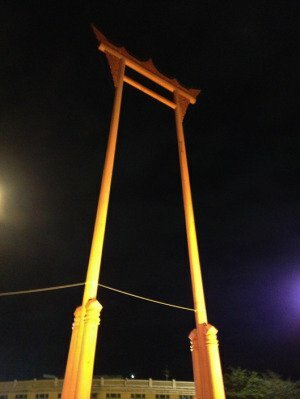 The Giant Swing was used as part of the Swing Ceremony, one of 12 royal Brahmanic ceremonies annually performed to celebrate the new year, to propitiate Brahmanic gods and to ask for their blessings. The Swing Ceremony used to be grand, and the highlight was when three groups of four Brahmans each rode on the Giant Swing, as a re-enactment of when Shiva descended to the earth. According to an ancient Hindu epic, Shiva was sent to earth after Brahma had created the world. When Shiva descended the earth, the great snake (Naga) wrapped around the mountains to keep the earth in place. After Shiva had found the ground solid, the snake went into the sea in celebration. The two tall pillars of the Giant Swing is representing the mountains, and the circular base is representing the earth and the seas. In the Swing Ceremony, the Brahmins would swing and try to catch a bag of coins placed on one of the pillars with their teeth. Sounds pretty dangerous and stupid if you ask me. Typical men to do something like that, just to show off how brave they are! 🙂 Apparently (and not so surprisingly) there were several fatal accidents where people got hurt and even died while swinging, so they stopped using it in 1935. Well, too bad, as it would probably be a spectacular show! Onto our next stop, the famous and mighty tourist attraction Wat Pho! 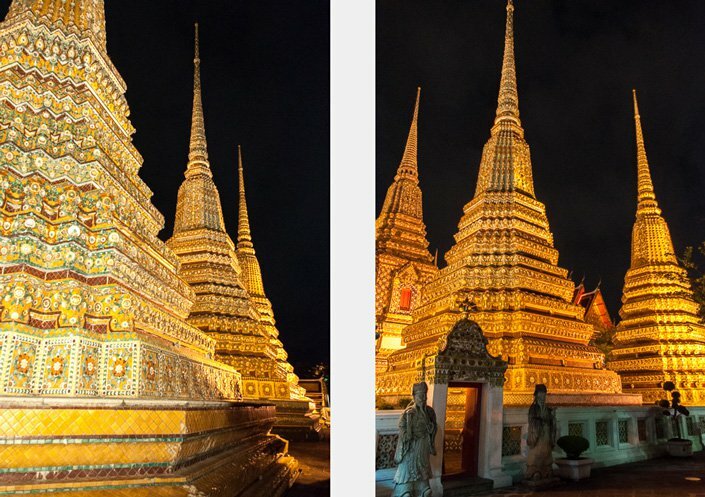 We have been to Wat Pho a couple of times before, but only during daytime. We didn`t know it was possible to enter the place in the evening, and best of all, for free! We were not allowed in to see the Reclining Buddha (which is in a building of its own), but could walk around the premises. We had the place all to ourselves, and it was so peaceful and atmospheric! I could have stayed there forever, as it felt magical. Next up, after another fun tuk-tuk ride through the busy streets of Bangkok, was the bright and colorful Flower Market (Pak Khlong Talat). Although we had heard about this market before, we have never been there. 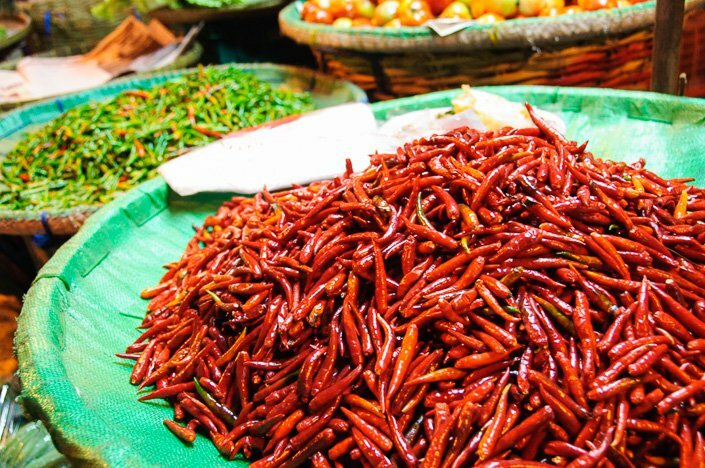 It was a beautiful and vibrant market to visit, full of colors and lovely smell! Here you can find all kinds of flowers, vegetables, and fruits. 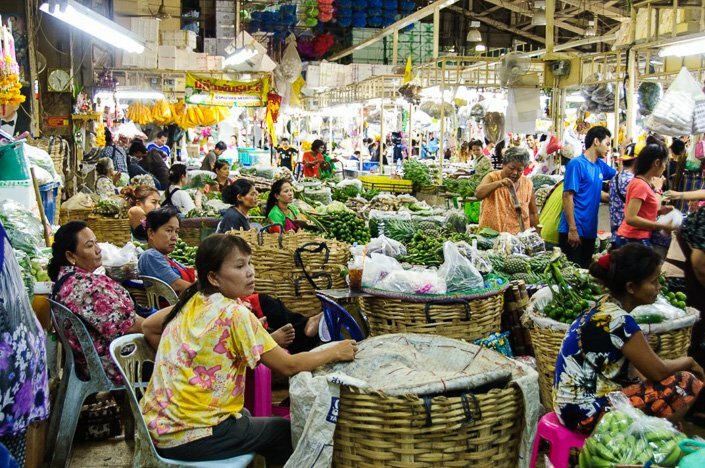 Though the market is open 24 hours, it is busiest before dawn, when boats and trucks arrive with flowers from all over Thailand. 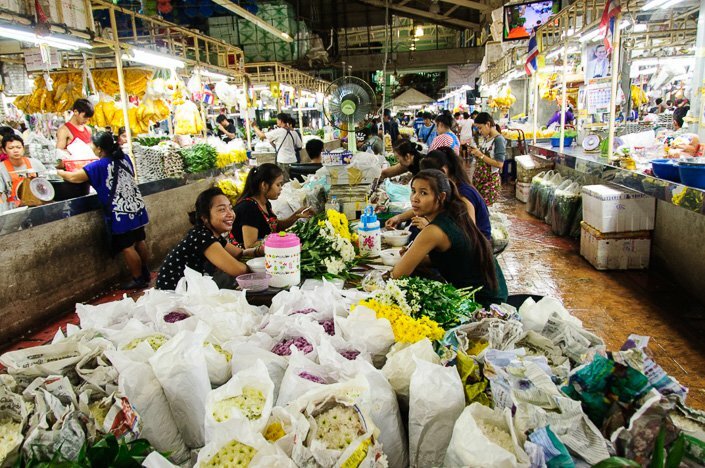 Here both consumers and wholesalers come to buy flowers and vegetables. 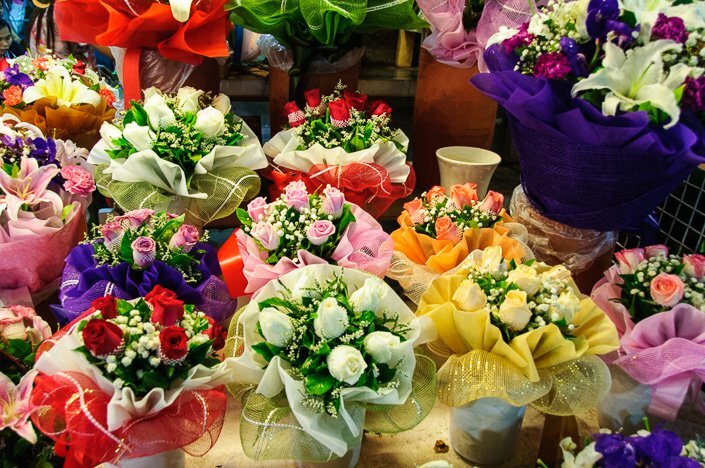 Many local florists come to the market early in the morning to stock up on flowers to sell in their shops the following day. Also, the poor who make a living out of stringing and selling flower garlands on the streets, buy sacks of jasmine and marigold flowers here. 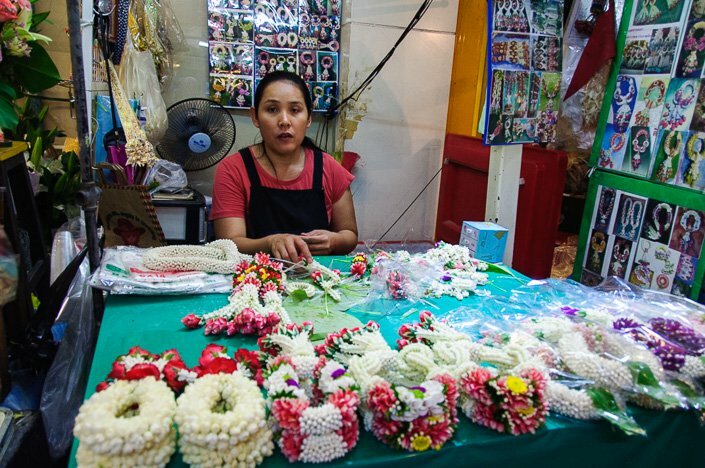 Women making beautiful flower garlands of jasmine and marigold flowers. They smell awesome! 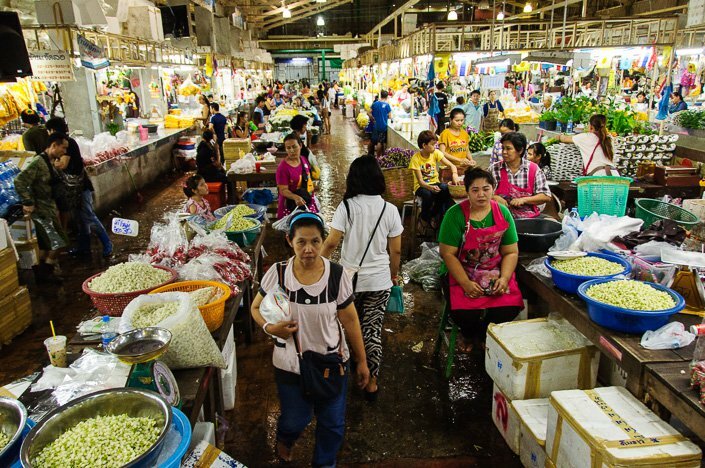 The market has a long history, all the way back to the reign of Rama I (1782-1809) when it was a floating market here. Later it changed into a fish market before it became the kind of market it is today. 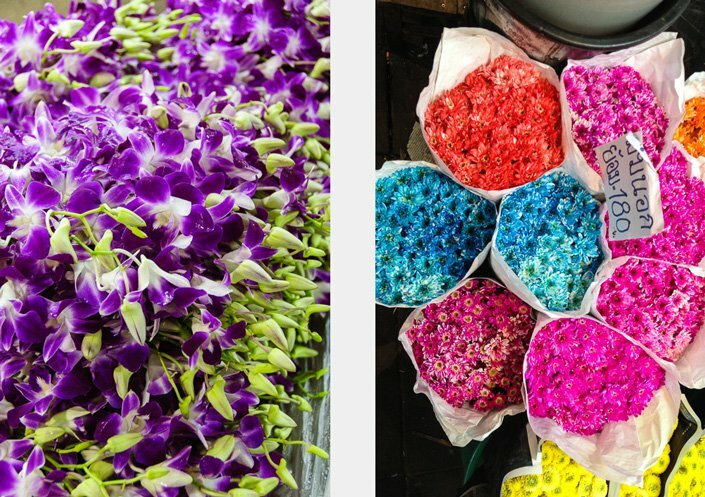 It has been a flower market for over 60 years. Beautiful bouquets of roses and lily flowers. 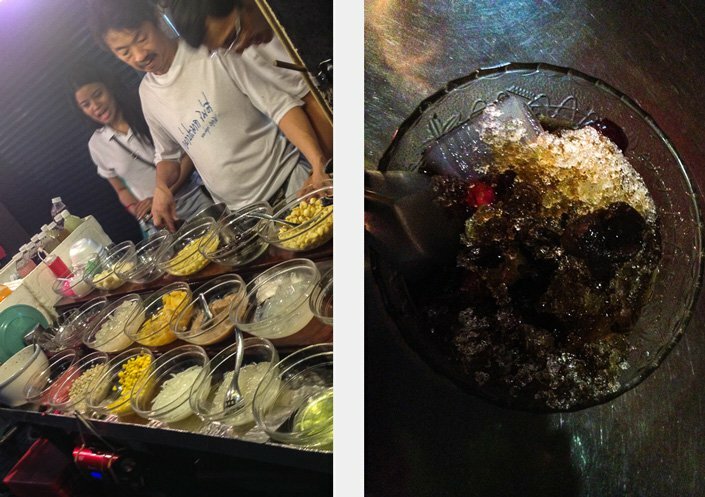 Our Thai-Chinese dessert, containing 16 different things covered in ice. We ended the tour just before midnight. 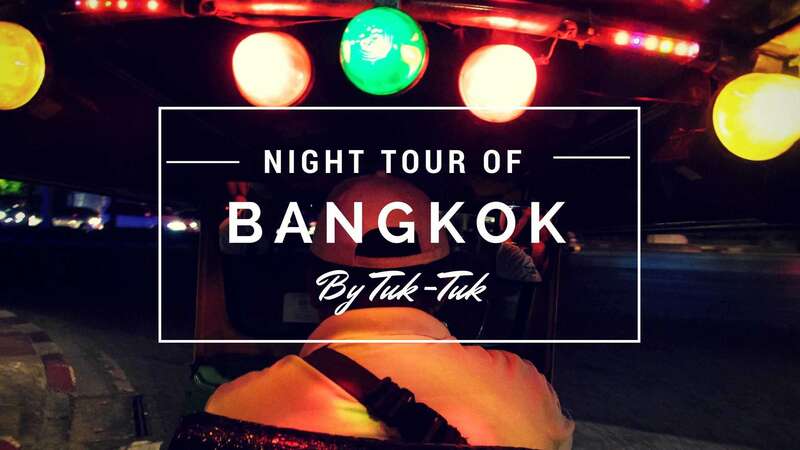 We very much enjoyed this night tour of Bangkok by tuk-tuk with Expique! Our three guides were so helpful and friendly, and had a lot of in-depth knowledge of Bangkok and could answer all our questions. 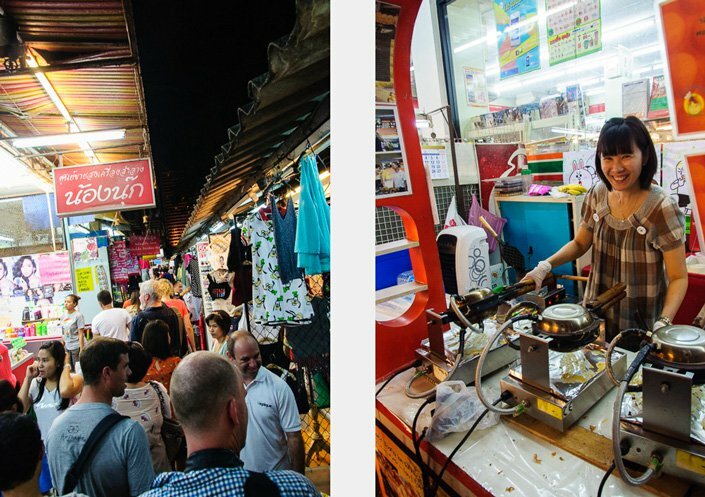 Even though we have been to Bangkok many times, they showed us places we have never been before, places we wouldn`t know of or find ourselves. 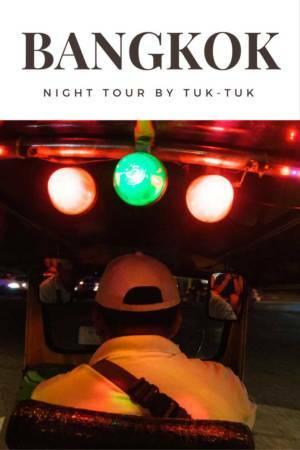 This year (2016) they added another Tuk Tuk tour to their program. It is also a night tour of Bangkok but with even more focus on food. 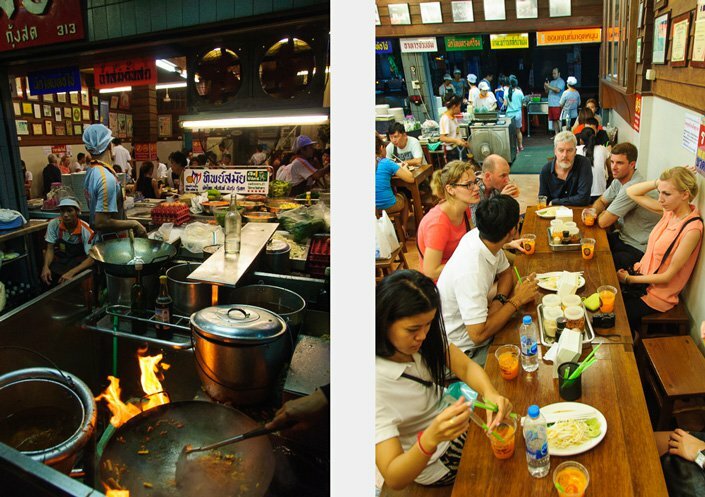 It is called “Evening Food and Tuk Tuk Adventure”. 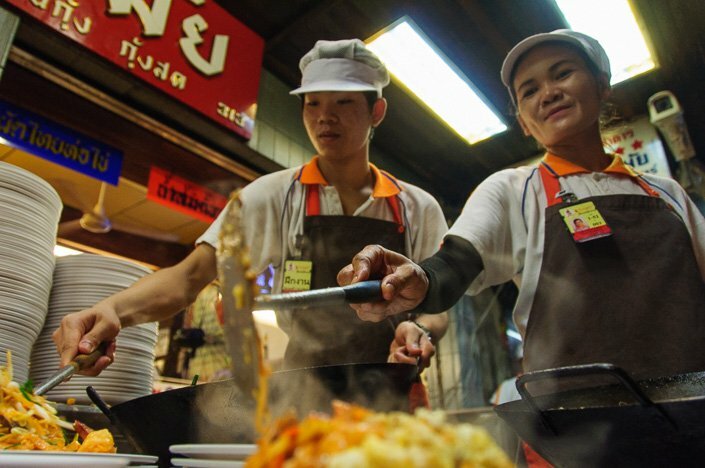 It sounds really cool and we hope to try that out next time we are in Bangkok. You can read more about it on the Expique website. 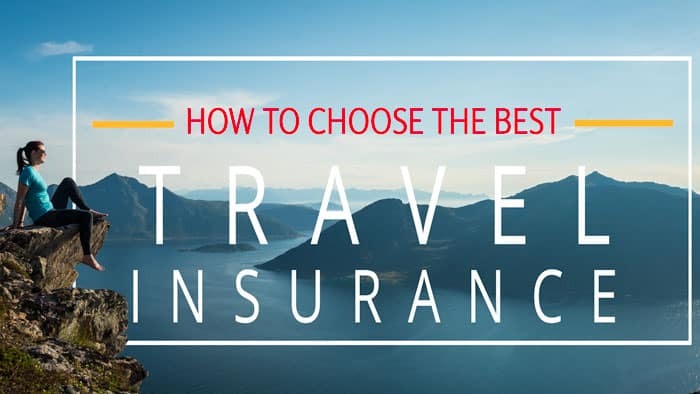 Bangkok offers a wide selection of accommodation for all budgets, and you will have plenty of choices when it comes to finding the right place to stay. 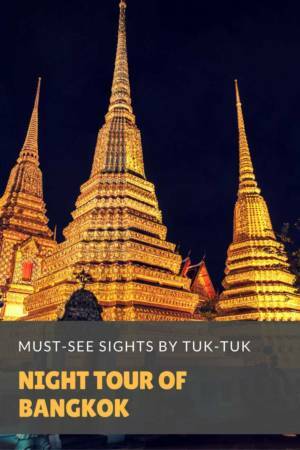 Bangkok is pretty affordable when it comes to accommodation, so you can get some really good deals and even find five stars hotels very cheap compared to other places in the world. However, accommodation prices do vary greatly with the season. 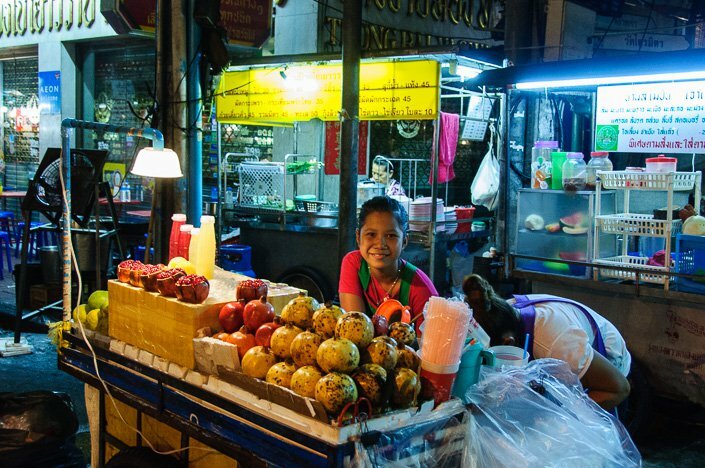 Below are some of our favorite hotels in Bangkok. We have stayed at all of the hotels below. 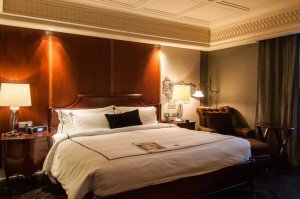 Read our review of Hotel Muse her. It is a cool and unique boutique hotel, perfectly located in the center of Bangkok! If you’d like to stay along the river without breaking the bank, the new Avani Riverside hotel is a great alternative to the usual riverside luxury hotels. 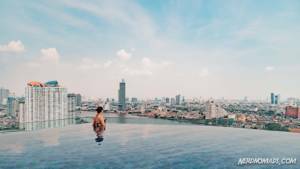 Rooms are super comfortable with fantastic views overlooking the Chao Phraya river and the fantastic rooftop infinity pool is probably our favorite in Bangkok. If you’re looking for a mid-range option close to Bangkok’s famous Khao San area, then the Casa Nithra comes highly recommended. The rooftop swimming pool is lovely, the rooms comfortable and the breakfast has plenty of options. 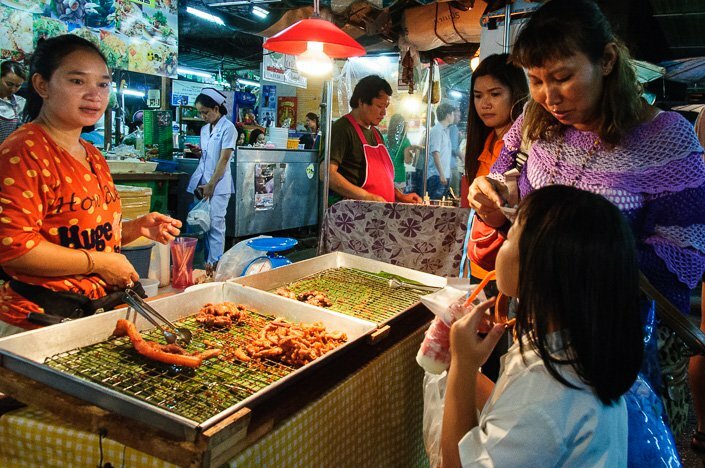 It’s located in a quiet area, yet Khao San is just an easy walk away. Hotel Icon is a small hotel centrally located on Sukhumvit road. The rooms are fresh and modern, big and comfortable with all the usual comforts such as flat screen tv, aircon, and free Wi-Fi. The rooftop swimming pool is great! 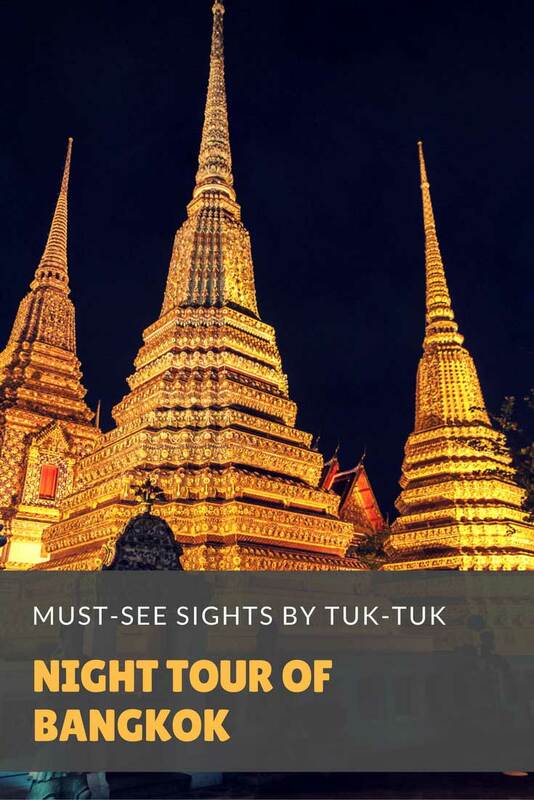 ⇒ For more accommodation options and tips on which areas of Bangkok that suits you best, read our complete guide to where to stay in Bangkok. Have you ever tried a Tuk-Tuk in Bangkok? Please add a comment in the comment area below! If you find this blog post interesting or useful, please share and like on social media! Thank you! Some of the above links are affiliate links, and we will earn a small percentage of the sale if you purchase through them at absolutely no extra cost to you! This helps keep our site running at no extra cost to you — so thanks! We were guests of Expique, but the words, photos, and opinions are our own. 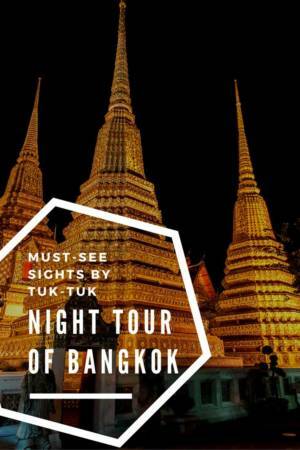 You can read more about Expique and their tours in Bangkok on their website. Many thanks to Expique for their hospitality! 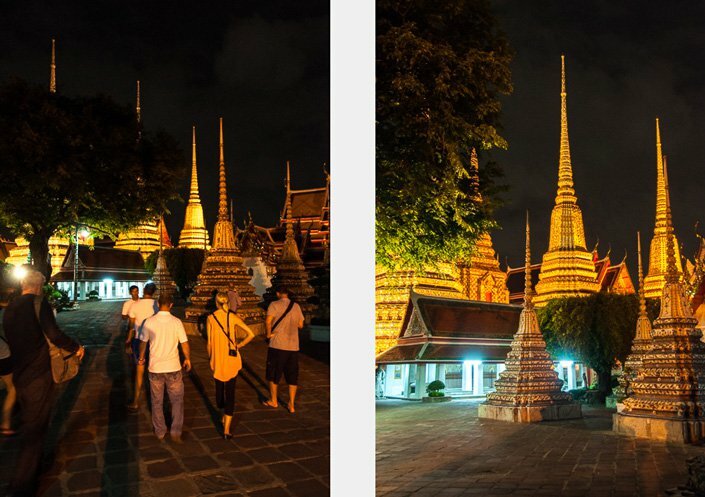 We also did not know that Wat Pho is open in the evenings. I think the stop there was probably my favourite part of the tour. We have been there before, but there is something magical about places like that after dark, especially when you are almost alone. Thanks for the post Maria! It brings me back to Bangkok and reminds me of the great time! It also reminds me of the fact that I still need to do a write-up about the tours. It’s just such a hassle writing with a laptop on your lap (hopefully my desk arrives Tuesday)! Looks like a fabulous tour by tuk-tuk! Judging by your lovely photos so many interesting activities could be done rather than be resigned to a couple of beers. Very inspiring for another visit to Bangkok LOL! Thank you Maria, this was so helpful and informative. We made a spontaneous decision to have a3 day vacation in Bangkok. I followed your advice on what to do in 3 days. Thank you so much! 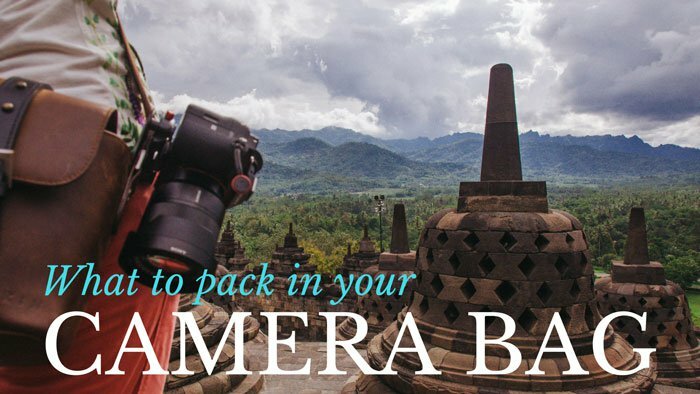 Glad our 3-day itinerary to Bangkok could be of help to you! I just stumbled upon this while doing my research for my not-so-far trip in Dec. There are SO many reasons for choosing bangkok, my first overseas friend visit after a long time of 1.5 years, my bf’s first international trip with me and New Years! 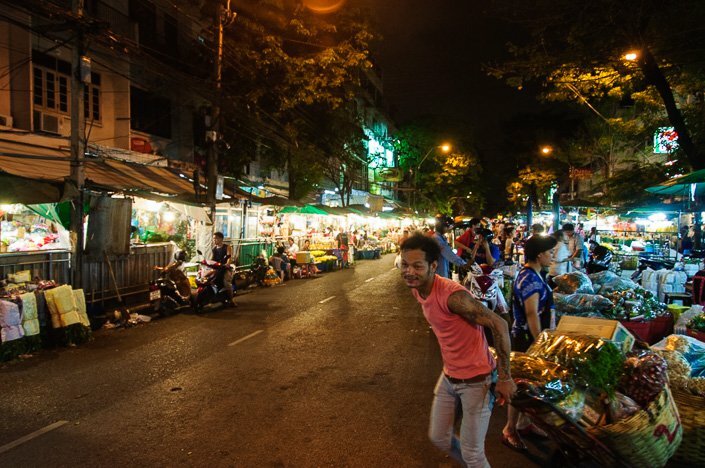 Are you based in Bangkok now? Thank you so much! 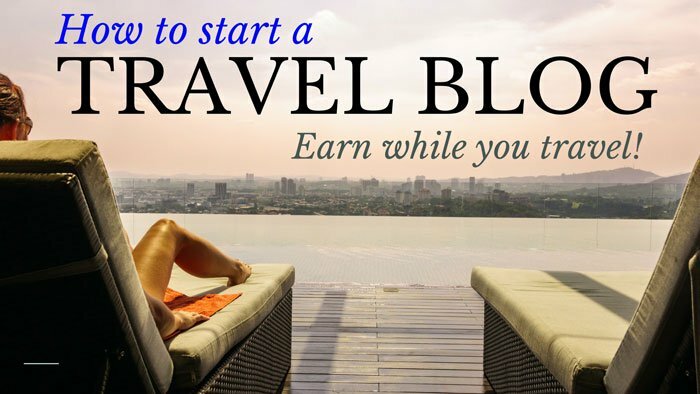 So happy to hear that our post could be of help to you when planning your Bangkok trip! I`m sure you will have an awesome time together with your bf! Have a great trip to Bangkok! 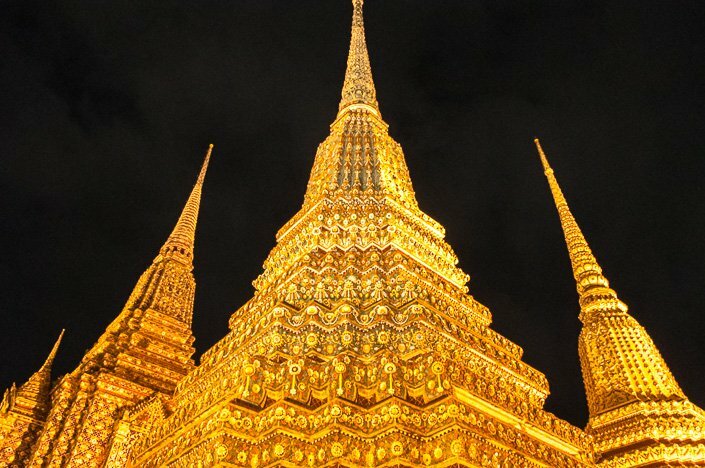 Bangkok is the best place to celebrate New Year! We have celebrated seven New Year`s Eves in this great city. We are not in Bangkok right now but hope to be back soon. 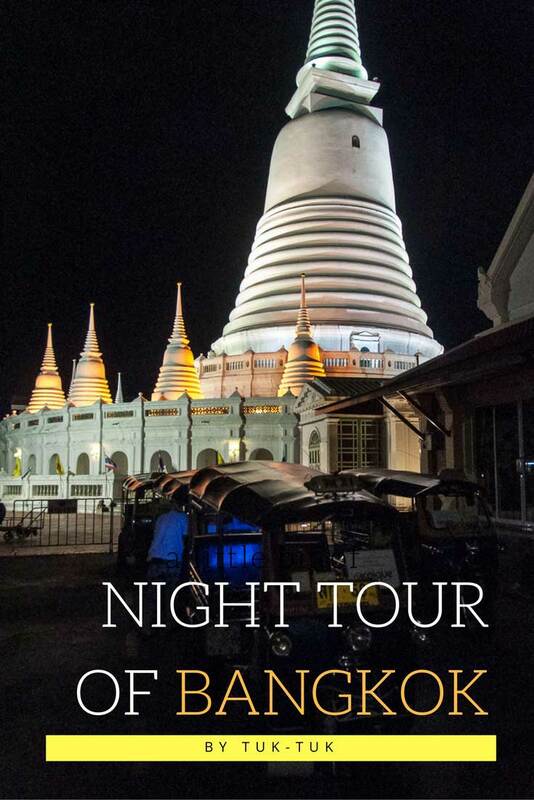 Its glad to know that you had funny on your night tour in Bangkok. 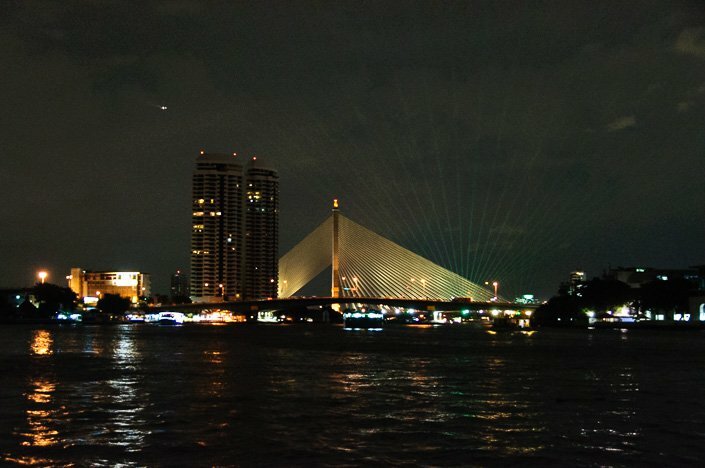 You’ll get to see Bangkok in different perspective plus it nice to explore the city when the weather is cold. 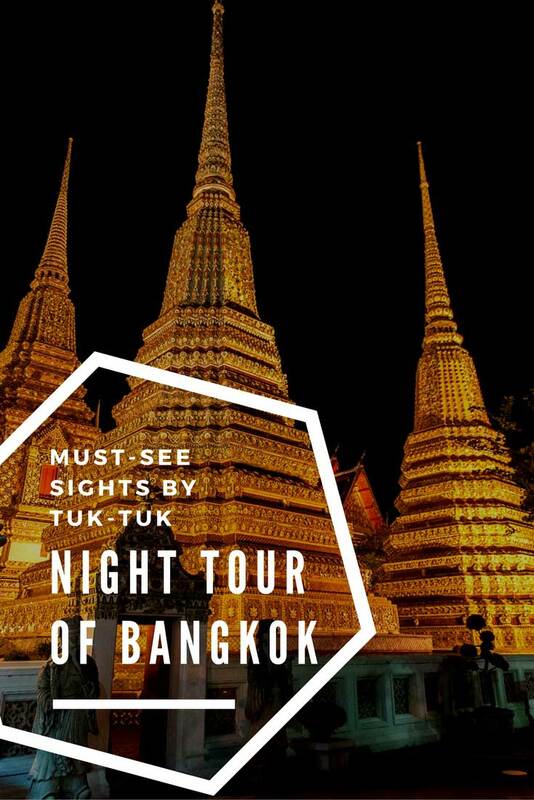 Yes, I think that one week is enough to see most of the highlights of Bangkok. Then you have time to relax a bit too, which is especially nice if you stay at a hotel with a swimming pool. 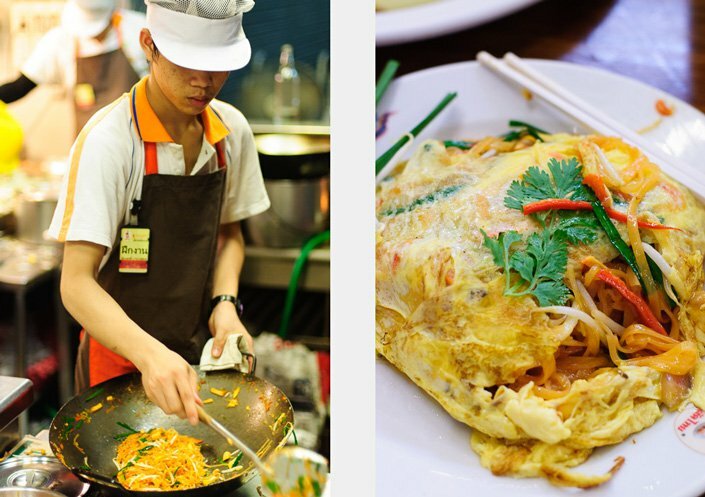 You will also have time to enjoy the many amazing restaurants, food markets, and cafes that the city has to offer. Have a fantastic week in Bangkok!